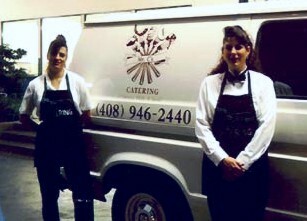 Mr. C's Catering has a very simple philosophy: serve good food and friendly service at an affordable, fair price. We have been in the food business in the Silicon Valley and surrounding areas since 1977. We will cater to fit your personal or budget needs. We can cater functions from 50 to 1000. We have cater anywhere from the beaches in Santa Cruz and Pismo Beach to your own backyard in San Jose or San Luis Obispo. We are a full service caterer serving you the simplest Drop Off Box Lunch to the China Sit Down Dinner. We have a very wide variety menu designed to give you a well rounded meal for breakfast, lunch or dinner. We also can custom design a hot or cold Hors d'Oeuvres tray for pick up or a butler-passed Black Tie event. Give us a call to have a Corporate Day to Day Menu sent to your door, or faxed if you prefer. Our staff are highly trained and professional service personnel to insure a successful event every time. Each event is carefully planned and discussed thoroughly with the client to insure personal security and to guarantee a successful catered event. We take pride in using only the finest ingredients available to prepare and create our menu. Mr. C's is known best for providing the freshest and most flavorful creations even during those "off seasons" which occur every year. We are an experienced corporate caterer, catering food to Silicon Valley businesses and homes in San Jose, Santa Clara, Sunnyvale, Los Gatos, Mountain View, Campbell and other cities in California's Santa Clara Valley and South Bay region. We now provide coast to coast catering in Paso Robles, Atascadero, San Luis Obispo, Pismo Beach, Arroyo Grande, Santa Maria and other cities in San Luis Obispo County and the Central Coast.